while enabling the optimization of operations of port ecosystems through IoT. The level of implementation of the PoF concept, which has to be based on a realistic assessment of the current capabilities of the different sizes of ports, and more importantly on the opportunities for enhancing those capabilities through the employment of technological, managerial and scientific approaches. Furthermore, since economic, environmental and social sustainability are intertwined, all three have to be achieved for their impact to be sustained. Therefore, while PIXEL is mainly focusing on the environmental sustainability of ports, it also aims at enhancing their economic and social sustainability. Where ‘Sustainable Port’ is considered as a port which is characterised by environmentally responsible, operationally efficient and socially conscious procedures and operations. Establish a single-metric index (PEI) to (i) integrate diverse environmental impacts of a port, (ii) provide an applicable environmental assessment tool and (iii) serve as a standardized and transparent metric for addressing the environmental impacts of port operations. Multipurpose port operations (e.g. containers, general cargo, bulk, passengers) vs dedicated ones (e.g. only containers), aiming to tackle the complexity of handling different types of cargo. What has to be made clear s that, although PIXEL is addressing small and medium ports, it is not a project only for these type of ports. PIXEL output aims to be a flexible and scalable solution for reducing environmental impact while optimising port ecosystems operations no matter their size. 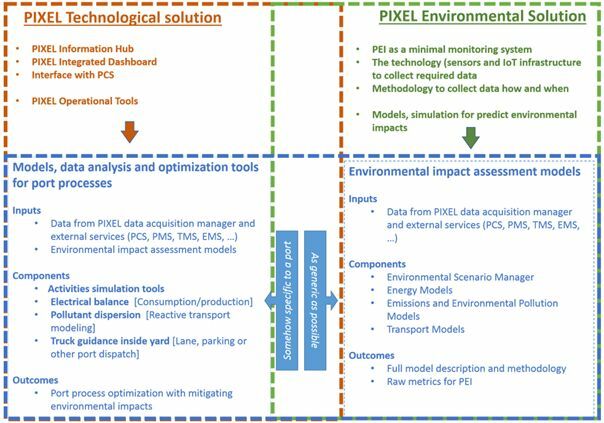 As its final output, PIXEL will provide an integrated technological and environmental solution, verified through real-life port use cases for environmental leverage and process optimization, as depicted in the following Figure. A port-specific, to a certain extent, part, being the models, data analysis results and optimisation tools developed for each one of the project ports. The environmental impact assessment models required as input providers to the PEI. Assess the results of the optimization exercises using PEI as an ultimate metric, thus expressing them in a way which can be understood by all port stakeholders in the same manner.